There are few things worse than suffering a serious injury. Not only may you have to live with tremendous pain and suffering because of the injury, but you may be saddled with burdensome medical and rehabilitation bills that can cause strain on your entire family. One of the worst injuries you can suffer is a brain injury, which can have devastating repercussions in every facet of your life. The personal injury lawyers at the Hickey Law Firm understand how devastating a brain injury can be. We can help fight for the rights of you and your family. Our firm is a member of The North American Brain Injury Society, The Brain Injury Association of America and The Brain Injury Association of Florida. We are committed to providing you with the informed legal counsel and powerful representation you need to file an effective personal injury claim. If you or a loved one has suffered a brain injury because of another person’s negligence or recklessness, call us today at 305-371-8000 for a free case review with one of our experienced attorneys. We proudly represent clients in the Miami, Florida area as well as nationwide. Brain injuries can be categorized as mild, moderate, or severe. Head injuries, which of course can cause brain injuries, are either closed head injuries or open head injuries. Closed head injuries occur when a trauma to the skull results in the brain coming into contact with the inside of the cranium. Such contact can result in bruising, swelling and internal bleeding within the skull. An open head injury occurs when the skull is fractured or pierced in any way and foreign material or bone matter contacts the brain directly. Open head injuries can pose a significant risk to the victim, as there may be blood loss and the potential for bacterial infection. If you or a loved one has suffered a brain injury, it is imperative that you be in close contact with your healthcare provider to ensure you are receiving the care you need. A brain injury can severely inhibit a person’s ability to live an independent and self-reliant life. The lawyers at Hickey Law Firm represent clients who have suffered any brain injury from minor to severe. We will lead you through the process of filing a claim for accidents resulting in these catastrophic injuries. According to the Centers for Disease Control (CDC), accidents involving falls account for the majority of TBI cases in the U.S. In fact, nearly 30% of all brain injuries in the country are caused by falls. Victims may be able to file a premises liability claim in these cases. Next are car accidents, truck accidents, and motorcycle accidents, which cause 20% of all brain injuries in the U.S. each year. Unfortunately, roughly 11% of all brain injuries are caused by the deliberate and violent actions of another individual. 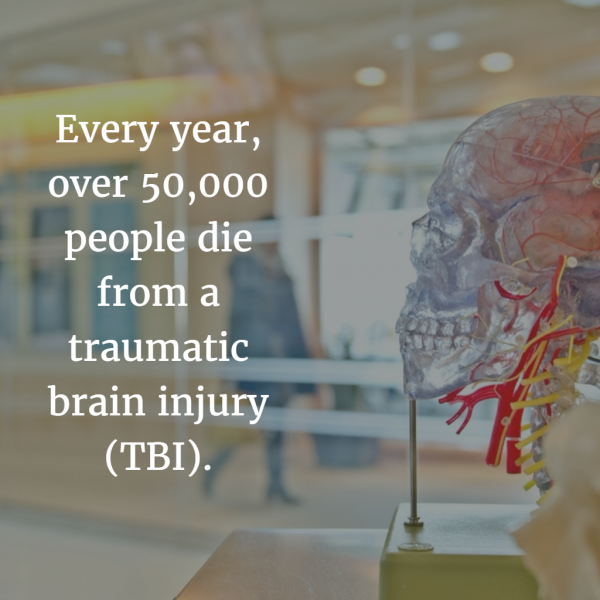 If you believe that you or another individual is suffering from a brain injury or TBI, it is important to seek medical attention as soon as possible. Brain injury occurs when a blow to the head causes the brain to swell against the skull, impairing important mental processes that affect your physical, cognitive, and psychological functions. In many cases, it is difficult to know the extent of the damage until the brain’s swelling subsides. Since brain cells do not regenerate like other cells in your body, even a mild traumatic brain injury can be life-altering. If you or someone you love has suffered a head trauma, even one you believe to be minor, and are experiencing any of these symptoms; seek medical attention as soon as possible. Suffering a brain injury can have severe consequences, and it is important to seek prompt medical care. Traumatic brain injury (TBI), also called acquired brain injury, occurs when a sudden trauma causes damage to the brain. TBI can result when the head suddenly and violently hits an object, or when an object pierces the skull and enters brain tissue. Symptoms of a TBI can be mild, moderate, or severe, depending on the extent of the damage to the brain. A person with a mild TBI may remain conscious or may experience loss of consciousness for a few seconds or minutes. The problem with TBI, or any brain injury, is that symptoms may not manifest immediately after the impact to the head. It’s important to be aware of the symptoms that present themselves so that you can get the medical care you need to stem any future damage to the brain. This is not meant to be an all-inclusive list. You can suffer from traumatic brain injury and only have one or two of these symptoms. Whether you have suffered a mild brain injury or someone you love has suffered a catastrophic brain injury, we can help you obtain just and fair compensation. For many victims, a brain injury may lead to permanent, lifelong damage and disability. We understand that dealing with the long-term effects of a brain injury is not cheap. Medical care is expensive, and fighting for your well-being while dealing with a brain injury requires significant financial resources. We do not want to engage in hyperbole or scare you — it's a simple reality that traumatic brain injuries tend to linger. It's an even simpler reality that the American medical system, while impressive in many ways, is not cheap. The lifetime costs and ongoing medical issues of a single traumatic brain injury can easily exceed more than $1 million. Fortunately, you are not helpless in the face of this reality. Due to the many inconsistencies associated with a TBI, you will want an experienced lawyer who understands the intricacies of these devastating injuries. Our attorneys have the knowledge necessary to fight for your rights, including how brain injuries happen, how they are treated and what recovery will look like. We will help you navigate through the complex laws that surround your case. Doctors cannot tell TBI patients or their families when and how their injuries will get better. Because it is so difficult to diagnose and find the source of the brain injury, the length of recovery time is uncertain and varies. For many, the injuries are permanent and life will never be the same. For others, life goes on with very few limitations. The effects of a TBI may cause an inability to work or live independently, and can also potentially cost millions of dollars in ongoing medical care, counseling, and rehabilitation. It may be possible to file a claim on behalf of a loved one if he or she was catastrophically injured and is no longer able to care for him or herself. In such instances, you may be eligible to file for financial compensation to cover a lifetime of medical costs and living expenses as well as for loss of future wages and pain and suffering. At the Hickey Law Firm, John H. (Jack) Hickey and the rest of our legal team fight for every one of our clients. We will do everything in our power to get you the best outcome possible. Contact us online to start building your case. Mr. Hickey has received numerous accolades for his legal work. He has been peer-nominated in Florida Trend Magazine as one of the "Legal Elite," which is the top 1.7 percent of all lawyers. We know how devastating a traumatic brain injury can be, and we will fight for your rights to get you and your family the compensation you deserve. If you are in the Miami area and have further questions about your brain injury case, please contact Hickey Law Firm by calling 305-371-8000 for a free case review with our experienced brain injury lawyers. We represent TBI victims in Florida and nationwide.